In this week’s blog, we will be looking at Algae Free; our all-in-one algae, moss and mould remover, and how it can help you this winter. With winter coming, most people will be thinking about preparing themselves for snow and ice and planning how they intend to deal with these problems (if they’ve read our last blog, they’ll know Ice Break is the way to go). However, there is something else that can be even more damaging than snow and ice, especially to business properties, and is something not many people would even think about…algae. You may be wondering how algae, as well as moss and mould, could be a problem during the winter. Nobody really thinks about plants being an issue during the cold winter months, as the majority of them die because of the weather. However, algae and moss doesn’t disappear during winter; it freezes. You still might not see this as a major issue, but if a large amount of algae and moss on the roof of a property (which is where it is often found) freezes, the weight of it can have a damaging effect on the roof of the building, to the point where the roof can even collapse because of the strain. So now you’re starting to see why removing algae before winter comes is important, you’re going to need the right product to deal with it. Algae Free is that product. Algae Free removes algae, moss, mould and fungi from a wide range of surfaces, including stone, masonry, concrete and, of course, roofing. As well as removing the algae and moss, it also stops the growth of further algae and moss by killing the plant spores. Algae Free isn’t just effective at removing algae and moss in preparation for winter. It can be used all year round and is so eco-friendly that it won’t effect or damage any other plants in the surrounding area (when diluted). 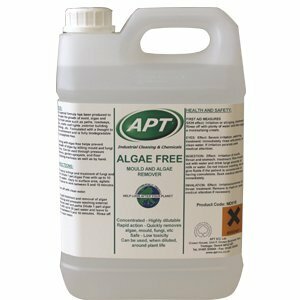 If you are interested in buying Algae Free, please click here to go to our product website or here to buy it from our Amazon store.